Tony Bellew (20-1, 12 Ko’s) failed the last time he got a title shot against WBO light heavyweight champion Nathan Cleverly in losing a 12 round majority decision to him two years ago in October 2011. Bellew, 30, is now on the cusp of getting another world title shot, this time against the winner of the Adonis Stevenson vs. Tavoris Cloud fight. Bellew is tentatively scheduled to fight the winner of that bout on November 30th, which just happens to be Bellew’s birthday. I seriously doubt it being his birthday is going to help him beat either Stevenson or Cloud, because those guys are a step up from Bellew’s recent opponent Isaac Chilemba. We just saw Bellew struggle badly against Chilemba twice and look terrible both times. Hearn should realize that Bellew’s chances of beating the likes of Stevenson or Cloud are astronomically small. He’s basically out-skilled by both guys and this is a terrible match-up for him. Stevenson is way too fast for Bellew to deal with, and about the only thing he can do against him hold on all night long to try and keep Stevenson from throwing punches. 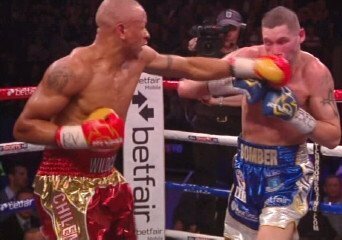 If Stevenson’s hands are free to throw his shots, Bellew is going to blasted out quickly in this fight, even if he tries to stay on the outside like he did in his second fight against Ovil McKenzie. It’s good that Bellew is getting another title shot, but it’s bad that it has to come against one of the two best fighters in the 175 lb. division. Bellew won’t have a chance against either of them. He’d be better of being put in with Cleverly again or WBA champion Beibut Shumenov.